You can help keep your sewer flowing ! Can It - Put fatty and greasy food scraps in a can and then the garbase, not the drain. Scrape It - Before washing, scrape out fats, oils and grease residuals from pots, pans and dishes. Trash It - Put fatty and greasy food scraps in the garbage, not the drain. Also, avoid disposing of coffee grounds, egg shells and disposable wipes down the sink and toilet drains. In addition, other things that are prohibited from going down the sewer include concrete and discharges with scalding temperatures. If you have a sewer easement on your property, keep it exposed and accessible. Call us immediately if you notice any problems with the sewer system or notice sewage flowing out of a manhole. Disposable disinfectant wipes, baby wipes, and even so‑called “flushable” wipes cause serious problems for the sewer system, as they do not break down once flushed. Please don’t flush them, trash them instead! 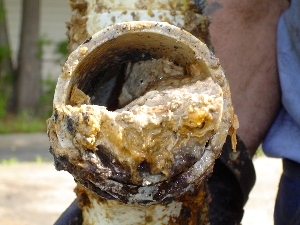 Treat Your Pipes Right - Learn how to prevent sewer clogs at home. The majority of sewer backups and overflows caused by fats, oils, and grease (FOG) originate in residential areas. You can help prevent clogs by learning about FOG and how to dispose of it. Some common sources of FOG include: meat, fatty food scraps, lard, salad dressings, creamy or oily sauces, marinades, milk and dairy products, shortening, butter or margarine and peanut butter. Correctly Train Your Employees - And avoid fines, lost business, and cleanup costs. Contact us for more information to train your staff and keep your establishment clean and productive!